As I was thinking about the enormous Suh contract, I wondered what the best allocation of resources would be for free agent players. In other words, would a team be better off with a few superstars plus a bunch of role players? Or would it be better off with a squad full of relatively evenly paid and evenly talented players? Roster construction in the NBA certainly seems to adhere to the superstar model, but the NFL is different in many ways. I looked at this question several years ago, but didn't realize what I had stumbled on. I found that teams with higher median salaries outperformed teams with lower median salaries, holding overall team salary equal. In other words, teams without a lot of heavily paid players tended to win more games. A few years back, I also found that, for offensive lines, median salaries correlated with performance better than total salaries. And I now understand, mathematically, why this must be the case. Before I go any further, let's take a look at the value curve for free agents. The chart below plots all defensive players in the 6th or later year of service at all positions from the 2006-2014 season. 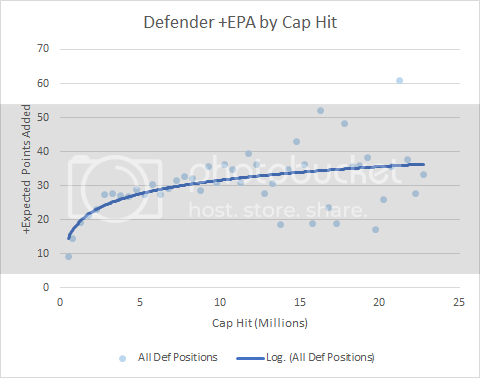 It shows +Expected Points Added according to annual player cap hit. There's an unmistakable shape to the curve. As we'd expect, despite the noisy data, it's clear that players are paid more for greater production. Despite all the criticism they get, GMs appear to be pretty good at their jobs. But there is an unmistakable trend--there are diminishing returns across the range of salaries. Here is an aggregate plot that combines all the positions. The free-agent value curve is concave. In other words, it shallows out and bends downward as salary increases. My hunch is that the true curve may not be this extreme due to how salaries are often structured for the very top players, especially older players. They tend to be back-loaded, kicking cap costs into the future in exchange for performance now. Still, the fact that the curve bends downward, at least to some degree, is as certain as these things can be. Looking at this curve, I was wondering what is the best allocation of a limited budget on free agents? In a bricklayer world, a GM would purchase as many players as possible at the point on the curve with the highest ratio of production to cost. In that scenario, he'd want to hire the maximum number of league-minimum players (at 14 +EPA/$M). But football is not a pure bricklayer system. There can only be 11 players on the field at once. So would it be better for the GM to hire a couple super-high value guys and then fill out the rest of the depth chart with lesser-paid players, or try to spread payroll around as evenly as possible? The idea would be to maximize "performance density," that is, to squeeze as much production onto the field within those 11 players as possible. Let's consider an abstract example. Say a GM needs to find 11 defenders, all free-agents, and he has decided that he wants to budget no more than $44M of his cap on these FA starters. Assume that there are plenty of players available at each position and at each price point, and assume individual performance is additive. Given the value curve above, the optimum allocation is to distribute the cap funds evenly. 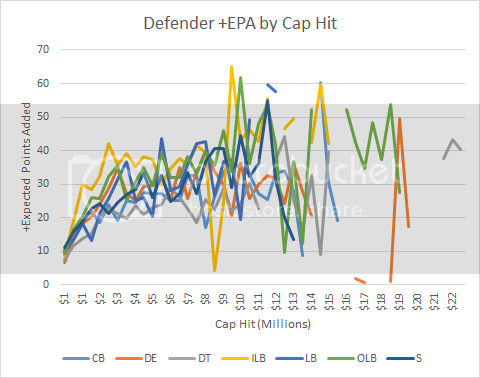 The maximum production possible is achieved when he would spend $4M on each FA, giving him 352 +EPA on the field. No other allocation can produce a higher total. In fact, it's mathematically provable that given a budget cap (C) and a limited number of players (n), that for any concave value function (one with diminishing returns), the optimum allocation is an even distribution at a price point of C/n. If the value curve bent upward (was convex), the optimum would be to get one of the highest paid players possible, and fill in the rest of the roster with replacement level players. Of course, no team ever fields 11 FA veterans as starters, and they need depth, and there are various positions (players are not commoditized substitutes), and so on. But the concept remains in effect: the best allocation is the one closest to an even distribution. If a GM has 4 spots to fill and wants to spend no more than $16M per year, he'd be better off with four $4M guys rather than one $13M guy and three $1M guys. To be perfectly clear, I'm not advocating a GM spend no more than $X on any one player or that the curve in the chart above is perfectly accurate. I'm not saying that all defenders are interchangable parts and I'm not pretending that there is some magical buffet line of healthy free agents to shovel onto your lunch tray. What I am saying is that there is a mathematical reason for what we generally observe--Enormous free agent splurges often don't translate into winning. Teams with relatively even distributions of salary appear to win more often, a signal detectable despite the noise of year-to-year variability. In practice, this suggests the Dolphins would be better off bolstering multiple positions with their FA funds, rather than putting them into a single player like Suh, regardless of how good he may be. 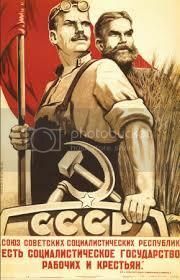 Additionally, despite the propaganda poster above, I am not claiming all players should be paid equally, regardless of their performance. They quite rightly should be paid according to their (expected) performance. However, from the perspective of a GM, his team would be better off with as even a spread of performance among players as practical, and that translates into relatively even salaries. A final note--I would suspect quarterbacks are an exception to the rule. Their role is singularly unique and important, and deficiencies at that position are very difficult to overcome with added performance at other positions.